BRUSSELS – A 3-year EU life cycle assessment [LCA] study to evaluate alternatives to fluorine-based durable water and oil textile repellents (DWOR) has concluded that fluorinated formulations have a negative environmental impact “10 – 40 times larger” than fluorine-free alternatives. The same study also confirms that while fluorine-free water repellent coatings can do the same job as their fluorine-based counterparts, these alternatives don’t perform anywhere near the same level as traditional ‘C8’ and ‘C6’ fluorine based finishes when it comes to oil repellency. This will come as no great surprise to chemists in the textile sector, but it does coincide with new claims by other scientists that replacement PFASs (per- and polyfluoroalkyl substances) may be just as bioaccumulative as original (legacy) PFASs that are being phased out – and are, therefore, not necessarily safer. If correct, this finding could have significant implications for product substitutions and EU policy. One industry expert heavily involved in the fluorochemistry sector told us that short-chain PFHxA – a degradation product from the manufacture of intermediates used to produce some short-chain fluorinated polymers (ie., C6) – could be restricted by the EU as early as 2021 and maybe phased out altogether by 2025. A three-year project funded by the European Union which looked at the environmental impact and functional effects of fluorine and fluorine-free textile coatings has confirmed that in order to have highly effective oil-repellent textiles, there’s a significant environmental risk. The study looked at three types of fluorine-based repellents and compared these with three types of textile treatments based upon silicone, paraffin and a solution that uses branched dendrimer chemistry. “At an environmental level, the results from the life cycle assessment (LCA) revealed that conventional fluorinated products have a negative impact in the range of 10 to 40 times larger than fluorine-free alternative products,” say the authors of the final EU funded report. On the technical level, extensive testing showed that alternative (fluorine-free) products achieved a water repellency matching the performance of conventional fluorinated products; however, their performance against oil did not reach any acceptable level. “This fact raises the need to establish an equilibrium and rationalisation of the requirements at the design stage to find a balance between environmental impact and technical properties according to the final application of the treated textile material,” concludes the report. 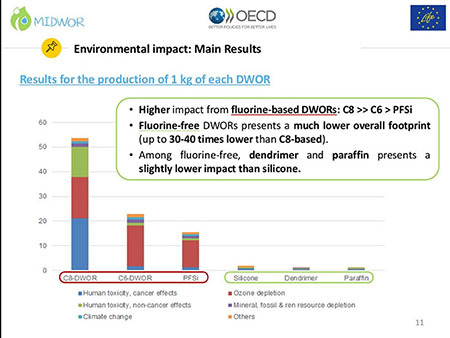 The full results of the ‘MIDWOR-LIFE’ project were presented in a recent webinar organised by the Global perfluorinated chemicals (PFC) group from the OECD. The chances are that if PFHxA is designated as a SVHC in 2019, then a dossier proposing restriction will follow soon afterwards, that should take about 2 years – so in that event, a restriction on C6 chemistry could be imposed in mid 2021.There could be a transition period of 3 years similar to C8 – but it’s by no means certain. However, there will still be special derogations for certain industries such as firefighters, military, etc. who will still be allowed to use this type of chemistry. The publication of the project’s conclusions also coincides with another scientific study released this month which backs up the above findings, saying that newer fluorine-based alternatives to legacy PFASs such as PFOA, may be no safer. It is estimated that there are more than 4,000 PFASs on the global market, many of which are used in textiles and clothing. Concerns have been raised about the persistence, bioaccumulation and toxicity of long-chain PFASs (C8), which has led to the phasing out of their production for the majority of uses and the increasing use of replacement PFASs, such as perfluoroether carboxylic acids (PFECAs) and perfluoroether sulfonic acids (PFESAs). However, information on the identity, frequency of use, and potential impacts of these alternative PFASs remains scarce. A new report published in Environmental Science & Technology, 52: 7972-7980. DOI: 10.1021/acs.est.8b01268 says the findings show that new replacement chemistry is just as bioaccumulate as legacy PFCs.